Featuring special guest star, John Scoleri! Bob and Bruno are vying for the affection of Ellen but Bruno has the upper hand: he'll stop at nothing, including Bob's murder, to get Ellen to a chapel. After disposing of Bob's body in the casket of a man buried decades before, Bruno explains to Ellen that his rival has probably headed off to the big city to find a more suitable mate. Heartbroken, Ellen marries Bruno and the couple settles down to live a quiet life. Well, it would be quiet if Bruno didn't talk in his sleep. When his frightened and outraged bride confronts him about his nocturnal admissions, Bruno strangles her and then murders the maid, who's unfortunate enough to have witnessed the skirmish between her employers. In a house filled to the brim with witnesses, Bruno stands no chance and soon is on the run from the cops. He scurries down to an old house, the basement of which gives way to an ancient "underground railroad." 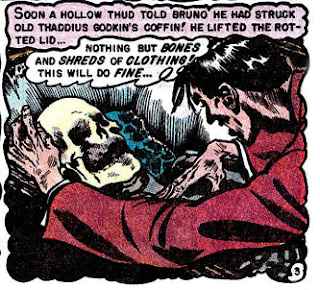 When he hits a dead end in the tunnel, Bruno digs up and finds himself confronted with a rotting coffin. 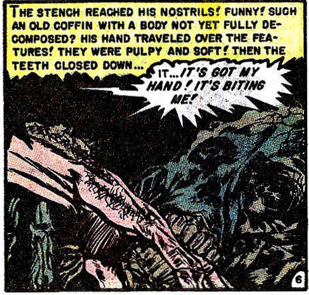 When he tries to move the casket, the wood gives way and his hand becomes lodged in the mouth of the corpse inside. Bruno bleeds out and it's only afterwards we discover that the corpse was Bob's. Ghastly's art shores up the weak Feldstein script and sometimes that's all you need. Interesting that Al is still skirting around the "resurrected corpse" scene and attributing Bruno's death to misadventure and a whole heaping helping of coincidence. "Horror in the Freak Tent"
Looey Glantz is one sick puppy, the owner of a freak exhibit at Henry Hastings's carnival. Looey loves to torture his poor employees and, finally, pushes them a bit too far. After one of Hastings's other performers, the knife expert Zolto, tires of witnessing Looey's masochistic fun, the two men argue and Looey blinds Zolto. The freaks convince Zolto he can perform just as well without sight and they set up a practice . . . without notifying him they've tied Looey to the board! Ah, now that's more like it! We've finally gotten to one of those classic EC (-choke-) finales with "Horror in the Freak Tent" rather than the abrupt or telegraphed climaxes we've been subjected to so far. Yes, "Horror" borrows liberally from Tod Browning's Freaks but Al manages to inject a liberal dose of originality as well. And Wally's art is to die for. Boys! We've officially turned the corner, I believe. 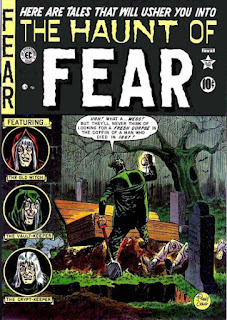 That feeling only intensifies with "A Tasty Morsel!," the first real EC horror story illustrated by Jack Davis (no, I don't count HoF #4's substandard "The Living Mummy," sorry), the artist who will become second only to Ghastly in the hearts of EC horror fans. The story, again by Al, is rubbish (man stays at creepy old inn for the night and discovers the innkeeper is a vampire . . . no, he was only dreaming . . . no, when he wakes up it's all true!) but Jack's rotund, sharp-toothed ogre could almost be seen as the blueprint for his future nightmares. Jack: The Jack Davis story shows that his art had not yet reached the classic stage with which we're all familiar. The story was the weakest of the lot. Ingels's tale is nice and gruesome, but the art is so poorly reproduced that I'd like to see the original pages. I agree with you about Woody's freak story--it's just what we've been waiting for, though I would have liked to see the human pincushion at the end rather than just imagining it. As for Craig's story, the final twist was disappointing but I'm so enamored of his art and storytelling skills that it hardly matters. 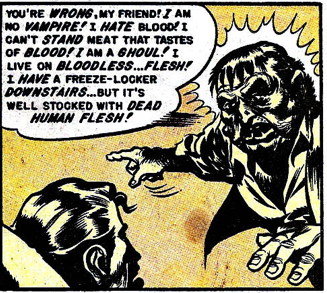 Jose: Graham Ingels demonstrates with “A Biting Finish” that his art is the standard representative of pre-code horror comics. Even his captions drip like blood on the page! Jack’s correct in stating that the scanned pages for this particular issue are not very complementary to the artists, but we’re still able to see some of the craft shine through, most notably Wood’s work on “ . 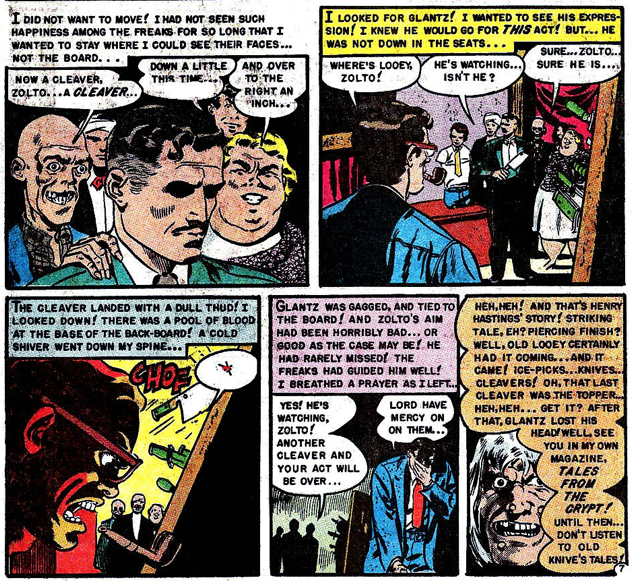 . . Freak Tent.” Feldstein shows his hand in “A Tasty Morsel” by reusing the second-person-dreaming-of-ghouls shtick that he tried already with “The Strange Couple” (VoH #14), but I found Davis’s rough-around-the-edges compositions endearing. “Seeds of Death” is ample proof that Craig is really starting to come into his own. His rendition of the Vault-Keeper here feels especially right, and his talent for those evocative, silent panels continues to work quiet wonders. Of all the E.C. artists, I think it’s Craig’s influence that you can find in a lot of modern graphic storytelling. John: I enjoyed “A Biting Finish,” and not just for the last few panels. I thought it was amusing how each time Bruno killed off a witness to his crimes, there was someone else around to see that. Reminded me a bit of the hilarious hitman scene in David Lynch's excellent Mulholland Drive. I prepared myself for "Horror in the Freak Tent" to regurgitate Tod Browning's Freaks right up to the very end, so I was pleasantly surprised that the ending was somewhat unique. That said, like Jack, I was disappointed that we were spared seeing Glantz's comeuppance. "A Tasty Morsel" didn't do much for me, art or story-wise. But at least it provides a teachable moment, in clarifying that flesh eating ghouls like their meat drained of blood. You'd think they'd pair up with vampires for efficiency. [Hey, I just mentioned "The Strange Couple"! 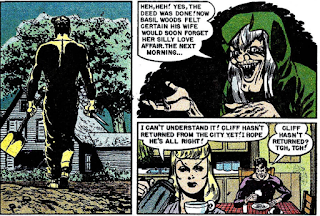 -Jose] "Seeds of Death" does a serviceable job despite relying on a number of the standard clichés (I personally think it would have worked better if Connie and Cliff were only having an affair in Basil's mind). It’s just dust bunnies and dustpans for Donald Yubyutch, a harebrained cleaning man who wants nothing more than to hop along with employer Professor Serutane and his pals on Serutane’s newly-finished time machine. Donald’s request is naturally laughed off by the stuffy scientists, but the cleaner has his own bright ideas. Why, conquering the Middle Ages with his superior intellect is a simple matter, so long as he has the right materials. Racing to the store, Donny buys a toy gun and model airplane to use as blueprints when he builds the real things in the 9th century. To further charm the local peasants, he purchases a transistor radio whose music will surely astound the masses. Back in the lab, Donald plugs in the time-top and throws the switch on his journey. He’s excited to find that the machine works, but the King’s royal entourage presses the happy fool for his business on the castle grounds. Donny's talk of weapon molds and airplane glue draws blank stares. The shmoe starts to realize that the materials he needs to wow his new friends haven’t been created yet. Same for the radio stations and the electric outlet needed to return him back to his century. Deemed a double-talking scullion, Donny is assigned to sweep the King’s dungeon. "The Time Machine and the Shmoe"
As Peter notes below, “The Time Machine and the Shmoe” is a kind of companion piece to Kurtzman’s earlier “Henry and His . . . Goon Child,” but it also bears the humorous streak found in “The Mysterious Ray from Another Dimension” (WF #16), showing that Kurtzman was intent on having a little fun with his science fictional premises. 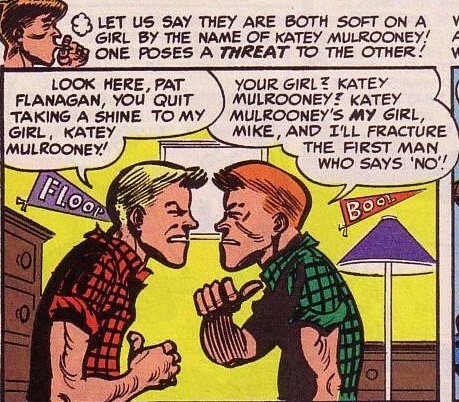 That’s certainly for our benefit, as Kurtzman’s irreverent tone and punchline endings act as nice refreshers from the doom-and-gloom stories that sometimes fall victim to unintentional parody. Speaking of which . . . Al Feldstein seriously fumbles the ball here with “Child of Tomorrow,” a ludicrous howler that finds our must-be-Kryptonian hero surviving atomic attacks, radiation poisoning, and death from starvation AND exposure only for him to find the United States populated by a gaggle of friendly mutants save for the ravenous two-headed variety, one of which is our hero’s heretofore unseen child, whose identity is only discovered after Dad shoots the double-sexed goon dead. The boring info-dumps of scientific facts that we’ve bemoaned in the past seem to be in dire need here, as by all rights Jim McSuperman should’ve died shortly after his jaunt in the mining tunnels ended with a cave-in. If any story we’ve read thus far was ripe for the MST3-K crew, this one is it. Peter: "The Time Machine and the Schmoe," a semi-sorta follow-up to "Henry and His . 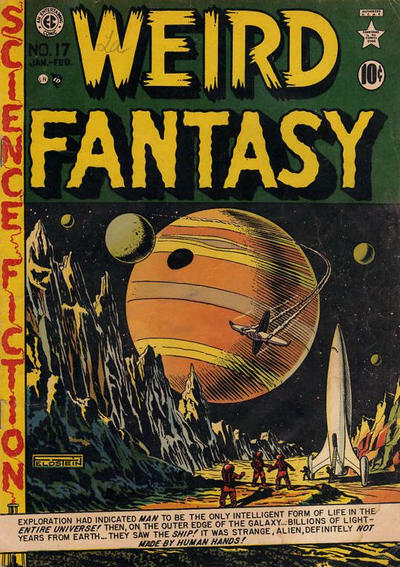 . . Goon-Child" (from WF #15), is proof positive that, while Harvey Kurtzman was pumping out effective science fiction and adventure tales, he also had a bit of a funny bone. These dark comedies were just a warm-up to the real thing, Mad, which Kurtzman would help launch and oversee the following year. "Deadlock!" is the closest yet to the Wally Wood we all know and love; the close-ups of the crew, in particular, are little slices of noir, gorgeously rendered. "Prediction of Disaster" is a fun little frolic but would be so much more effective had not the ending been used a few times already in the SF titles. Still, I have to admit that Jack Kamen comes through this time; luckily the narrative asks for no more than talking heads for much of the duration. 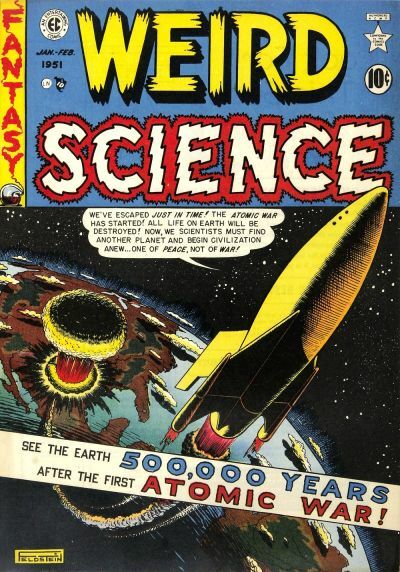 The only swing and miss this issue is the ludicrous opener, "Child of Tomorrow," in which we're led to believe that Jerry, having been in a mine when the bombs dropped, is immune to any lasting traces of radiation. Oh, and how about digging yourself out of a mine collapse with nothing but a shovel and a lunchbox? No problem? How about slashing your way through seven hundred miles of jungle for three years and emerging in the same nicely pressed shirt, no worse for wear and tear? Only one memorable moment in this turkey: the final panel revealing Jerry's offspring, half-man and half-woman, complete with one large breast! Makes you wonder if the thing is half-and-half all the way down. Jack: I really liked “Child of Tomorrow!” Feldstein’s art is very good, and I appreciate how Linda survives nuclear devastation and still manages to fix her hair in a most fetching way to go with the low-cut blouse and tight skirt. Now, that’s the kind of gal you want with you in a post-apocalyptic world! Kutzman’s story would fit right into Mad and Wood’s space saga looks forward to the classic work he would do on The Spirit the next year. I thought Kamen’s piece was the weakest, as usual, though I laughed out loud at the ending. 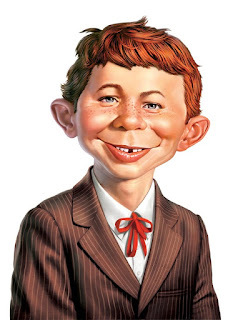 John: I also enjoyed "Child of Tomorrow" and the comical renditions of post-apocalyptic mutants. And I appreciate that they didn't shy away from showing the dead, two-headed Jerry's kid(s). "The Time Machine and The Shmoe" might have been more entertaining in MAD. It was a letdown for a WF story. "Deadlock!" 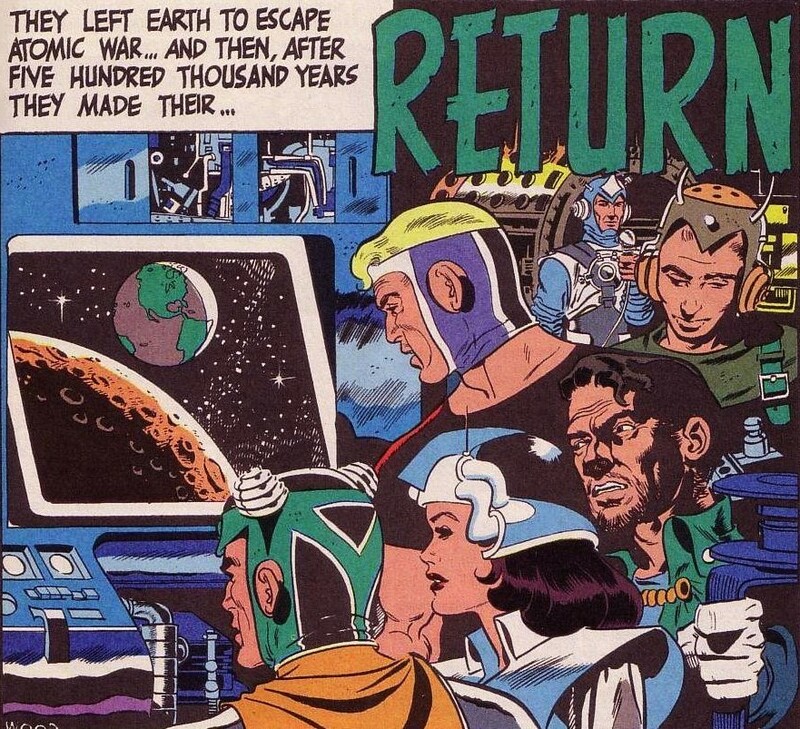 was my favorite in this issue, thanks to the fine art of Wally Wood, and the return of our favorite alien languages. Squa Trunt, everyone! While "Prediction of Disaster!" ends well, it is otherwise completely forgettable. Slick Charlie is a smooth customer and a savvy criminal to boot. Even when he’s held up after killing a bodyguard’s charge and stealing the dead man’s credentials, Charlie’s got something up his sleeve. Or rather, his cohort Garcia does, who makes short work of the bodyguard with a flip of his trusty dagger. The partners take their stolen credentials and enter the city on Manaos on the Amazon coast, posing as two delegates from an American diamond company. They leave the South American facility with a cool half million in jewels, but instead of boarding the ship back to the States the crooks chill in a local tavern where Garcia, sensing a double-cross, goes for his knife but gets it stuck in his own ribs when Charlie’s secret partner Smitty intercepts at the last minute. The duo leaves the tavern and cannily plans to cut a meandering path through the untamed jungle to throw the authorities off their tails. There’s only one snag in their scheme: their path cuts straight through Jivaro territory, and Smitty explains that the tribe is infamous for prolonged torture and shrinking heads. And who should our heroes meet immediately afterward? Charlie and Smitty are easily overpowered, and later Charlie listens as his partner’s pained cries carry on for hours. But Charlie’s always got something planned. Telling the tribe’s translator that he’s an all-powerful god whose impervious skin will destroy any weapon that touches it, Charlie is brought to the chopping block and, at his request, is given a quick whack of the machete upon his neck. The tribe is pissed by the treachery and Charlie’s grinning shrunken head is the final affirmation of his victory. Like Charlie, “Jivaro Death” is a slick little yarn that gracefully slipped through my expectations and ended on a surprisingly dark note that, in true EC style, confirmed that fate can even be on the side of the doomed and the dead. Kurtzman’s illustrations leave me frustrated that my vocabulary of artistic criticism remains so limited; there’s something about his art that I find intrinsically pleasing, a kind of unreal, hangdog style to it that can still be as emotionally resonant as a realistic, drawn-from-life portrait hanging in a museum. Are there any other fans out there who can pinpoint his gifts more eloquently? “War Story” has a climax that’s just as grim. A hardened sergeant relates a tale from his past to a young rookie facing death on the Korean battlefield for the first time, a WWII fable where a sadistic troop accidentally knifed his own twin brother to death after thinking he was ambushing a wounded Japanese general in the medical tent. Severin has some striking layouts, and though I couldn’t quite get myself into the story’s groove on the first read it becomes more impressive upon reflection. I was surprised to find that “Flight from Danger” wasn’t scripted by Al Feldstein, so similarly old-fashioned it was to “Hong Kong Intrigue” from the previous issue. There’s not a spark of engaging action in all of its six pages, especially disappointing considering it’s a story about a square-jawed type attempting a rescue mission in Nazi-occupied Germany. Craig’s art is shockingly bland and homogenized, not at all like the innovation we saw in the horror comics this month. Peter: The second issue of Two-Fisted Tales continues the stark contrast in story themes we saw in its premiere issue. On one hand we have the almost parodic noir elements of "Flight From Danger!," whose Steve Canyon-esque hero manages to exit a burning plane, with the requisite trench coat and fedora, into the arms of a scantily clad babe named Lisa. Their adventure goes nowhere and leaves us with nothing. While still on that lightweight side of the storybook, there's "Brutal Capt. Bull," a rip-roarin' sea adventure that does, indeed, begin brutally but takes a turn towards Easy Street about three-quarters of the way through. There's an overwhelming aura of . . . oh, how should I say it . . . "pillow fight night with the boys" to the tale, thanks mostly to Wally's "wink, wink" penciling. Then, more to my liking, there's the dark side of TFT #19. 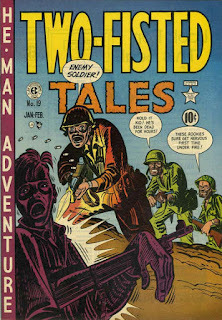 Whereas most of the war comics being published in 1950 were of the "War is, yes, a Nuisance" variety, ignoring the mental anguish and immoral acts on all sides, and heavily accenting the "America the Beautiful" mantra, you really get the sense, sixty years on, that EC war comics were written by scribes who didn't buy into the notion that war is essential. 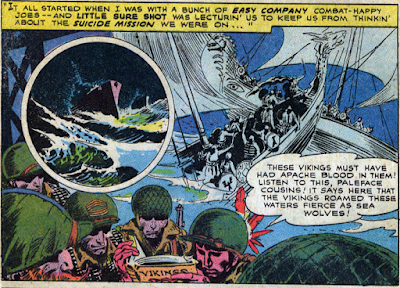 First up in that history lesson is Harvey Kurtzman's "War Story," which deftly blends conflict and crime, climaxing with a dialogue-free panel of exposition that says more than a hundred words in a caption box. This is the first we've seen of John Severin and I'm looking forward to more. My story for the month is "Jivaro Death," again by Harvey (who is fast becoming my favorite EC bullpenner) with that old chestnut, the jungle expedition populated by greedy cutthroats. Can someone out there name me a funny book story that has a more unrelentingly grim finale? Jack: Holy smoke, “War Story!” gets four stars from me all the way. 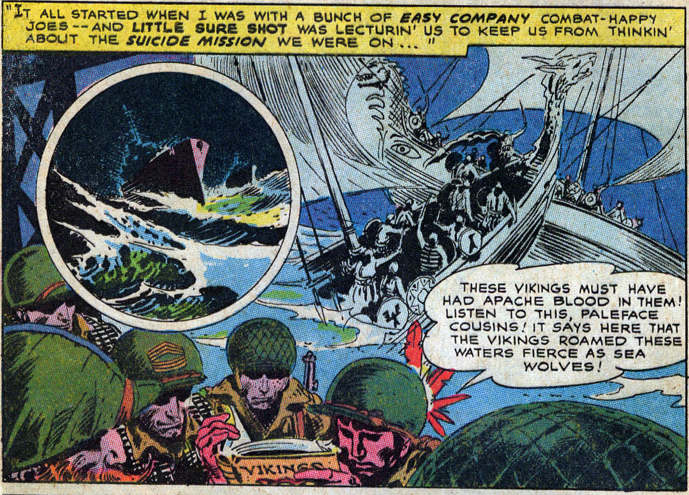 Story and art are both tremendous, though I see quite a bit of Will Elder’s inks in among the John Severin pencils. I only recall having read one EC war story long ago (I think it was called “If”) but this is raw, powerful stuff, written in the middle of the Korean War and only a few years after the boys came home from WWII. “Jivaro Death!” has a clever twist and Kurtzman’s expressionistic art is growing on me just as it is on Jose and Peter. I always thought of him as the “Little Annie Fanny” artist but we’re seeing that there was much more going on with Harvey. Craig’s “Flight From Danger!” is a straightforward yarn with lovely art, though we’ve come to expect a twist ending and it’s a surprise when one doesn’t appear. Wood wrings all he can out of “Brutal Capt. Bull!” and makes it more entertaining than it probably should be. John: Two issues in, and I'm getting the sense that Two-Fisted Tales may just not be for me. “War Story!” has a powerful climax, but was otherwise nothing special. 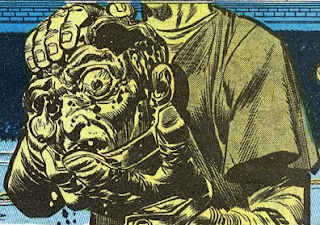 I found Kurtzman's art to be particularly unappealing in "Jivaro Death!" While "Flight from Danger!" benefits from great Johnny Craig art, it has little else to offer readers. And “Brutal Capt. Bull!” is also nothing particularly special. Maybe I had better stick with the horror and Sci-Fi/Fantasy books. Alvin is heartbroken when his girlfriend Marge tells him that she’s breaking off their relationship in order to marry his best friend, Bob. Wandering in a daze, Alvin joins up with a group on a guided tour of Rockefeller Center in Manhattan. The tour takes a surprising turn when the group heads into the basement and climbs into a time machine! Alvin goes along and finds himself in the year 2150, where he sees a sign advertising “Construct-A-Wife” kits for sale. He enters the store and buys a kit for a beautiful blonde, then goes back to 1950 and follows the directions, eventually creating a knockout named Jean. He immediately takes her down to City Hall and ties the knot. Soon enough, he is the envy of his friends, especially Bob, who is miserable being married to Marge. It all ends sadly when Alvin comes home from work one day to find a note from Jean telling him she was heading out for a guided tour of Rockefeller Center. Alvin never saw her again and assumes she went back to the future. I thought this story was hilarious and I loved Feldstein’s take on what makes the perfect wife. He also took full advantage of the opportunity to draw a bevy of beautiful gals in clinging costumes. Peter: "The Man Who Was Killed In Time" (or just plain "Killed in Time" according to some sources) takes the time travel gimmick that, so far, the EC writers had been aces on and pushes it just a bit too far. It's got a hokey premise (even for a science fiction story) and any story that needs a final page diagram to explain the contrived plot to the reader probably isn't worth publishing in the first place. "Made of the Future" doesn't fare much better but at least there are no Step A - Step C charts; Al seems to take his time setting up the plot and then squeezes a whole lot of story into the final page. "Return" has wonderful Wood art but a predictable twist. Hell, who cares? It's got wonderful Wood art! Leaving Best Story of the Issue honors to Harvey Kurtzman's "The Last War on Earth" which, like most of Kurtzman's mini-essays so far, simultaneously tugs at your funny bone and makes you realize that either Harvey was a seer or politics and human nature really haven't changed much in sixty years. Probably six of one and half dozen of t'other. Jose: Kurtzman’s story was undoubtedly the tops for this issue. 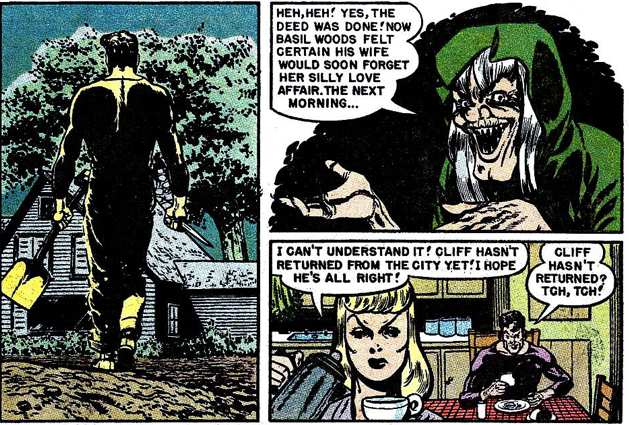 As Peter mentions, the artist had an almost uncanny ability to fuse madcap humor and sobering commentary together, sometimes in the very same panel. His breakdown of human conflict, and the enmities and affiliations that are borne from it like rising phoenixes, is especially impactful. “Made of the Future” seems like it has tongue placed more firmly in cheek than the serious-minded and seriously funny “Child of Tomorrow,” and it works as an okay fluff piece that could’ve been told more economically. (Did anyone else think the story was going to end with wife-from-the-future Jean leaving Alvin for his best friend Bob? That would’ve been great!) The conclusions to both “Return” and “The Man Who was Killed in Time” are telegraphed practically from page one, but Wood’s powerful art easily trumps Kamen’s run-of-the-mill work. Even though I've hardly ever read a thing by him, I can recognize the inspiration for "Jivaro Death" as a short story by Jack London called "Lost Face." The main difference is that that story was about Russian (?) pirates and Alaskan Indians or Eskimos who'd captured them. Good catch, Grant! Another example of "creative borrowing" by the EC staff.